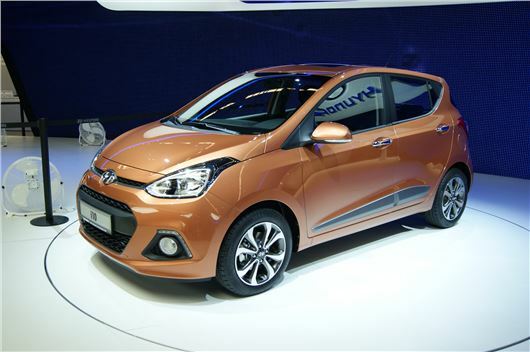 Hyundai has launched its new i10 at the Frankfurt Motor Show. Set to go on sale in the UK in December, the new i10 gets a sleeker design and more interior space. Hyundai hasn’t released any details on price, but they say that the new model will be priced similarly to the outgoing i10. Under the metal, the new i10 uses the same platform as the Kia Picanto - one of the best small cars around - but with the i10 will have to be good to compete with the likes of the Volkswagen Up, SEAT Mii and Skoda Citigo. The new i10 was designed in Europe - at Hyundai's Technical Centre in Germany - and as well as a longer wheelbase has relocated dampers designed to deliver better handling on all road surfaces. Hyundai says it has tuned the new model to provide refined driving with low noise levels similar to that of a larger hatchback. At launch there will be two petrol engines - a 1.0-litre with 70PS and a 1.2 with 85PS. Hyundai has yet to release performance and economy figures, but expect them to be close the Kia Picanto. Any interior pics yet HJ? Wow - I want one. Perfect second car (if the prototype driving impressions are anything to go by). If they make a sports derivative to combat the VW Up! GT (if that car ever actually materialises), then my interest in cars will be rekindled after so many disappointments and ugly looking cars in recent times.